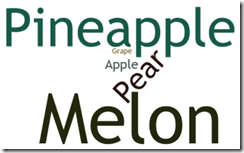 In this article I will show how to use the wordcloud2 component to integrate a tag cloud in a web page. The example I am using is a cloud with countries – the tag weight derived from the country’s population size. The component also requires a Canvas element in our web page. It will paint the tag cloud on the canvas element. Note: a page can contain multiple tag clouds, each in their own canvas element. The id of the target canvas is passed in the call to wordcloud2 for a specific tag cloud. – the call in the onload function to the WorldCloud function that references the canvas the id and passes an object that contains a list with tags (note: each tag consists of an array with two values, the first the text to be displayed for the tag and the second the relative weight). 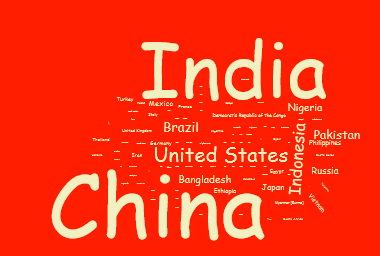 In my self defined challenge of creating a tag cloud based on country data, I had an obvious need for country data, preferably in JSON format. The site http://peric.github.io/GetCountries/ provides exactly that: the ability to downloaded a self configured file (XML, JSON or CSV) with country data. This helped me prepare the file countries.txt that you can download under Resources. This code assumes somewhat naively that the countries.txt document that contains the JSON based countries data is available from the same server and directory as the web page itself. Using XMLHttpRequest(), the file is loaded and subsequently (in the onload callback function) parsed into the countries variable. The next step I need to take is the transfer of the countries to the options object that forms the input of the WordCloud function. 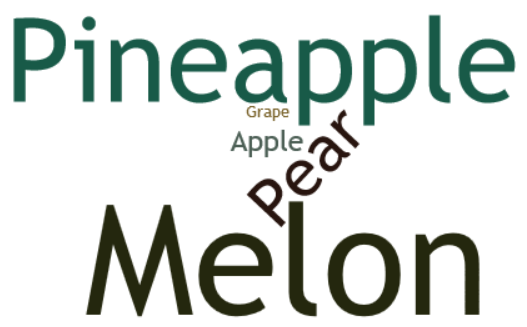 This is part of a function repaintCountryTagCloud that is invoked to do exactly what the name indicates. As I mentioned in the opening section of this article, a tag cloud can be used to allow users to navigate, filter/drilldown or otherwise initiate actions. I want to show next how using the wordcloud2 component and its support for callback-on-click, it is easy to extend the page with the countries tag cloud with a tag cloud that displays continents and responds to a click on a continent click with a filter action on the countries tag cloud. The implementation as it is right now has an issue: if one tag is much larger than all other tags, it is not displayed at all (try North America, South America and Oceania and try to find the big boys in those continents). This could be something to dive into. The wordcloud2 component also supports callback functions to set color for the tags (useful for example to have color derived from surface area) and on hover. 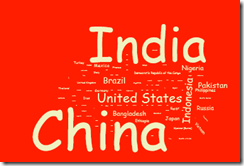 Try out the Continents & Countries Tag Clouds sample page tagcloud.html. Download the sources discussed in this article:tagcloudSources.zip.